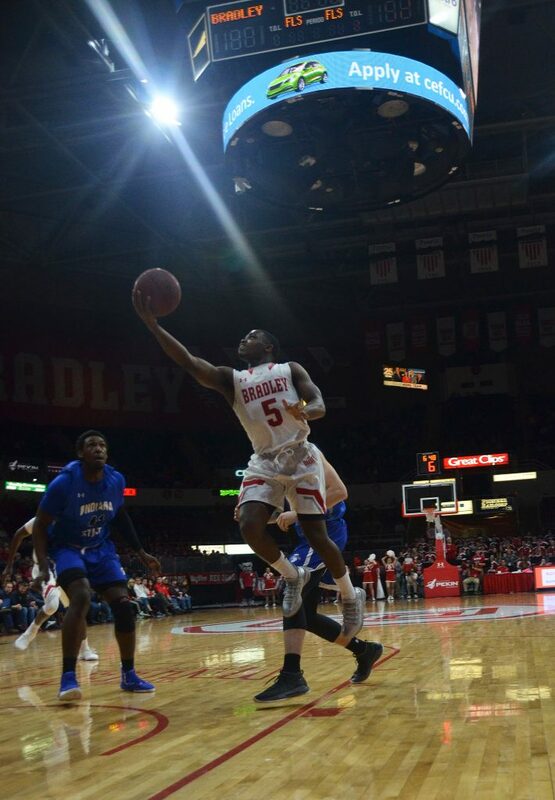 The Bradley men’s basketball team obliterated Indiana State, 96-67, on Saturday at Carver Arena. 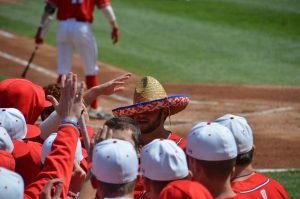 The Braves improved their record to 13-12 overall and 5-7 in the Missouri Valley Conference, while the Sycamores fell to 12-12 and 4-8 in conference. Prior to the game, the Sycamores had won the previous two meetings, including Bradley’s final regular-season game last year. team after coming off of a win at Northern Iowa. 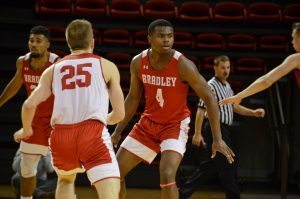 On Saturday the Braves started off in a favorable fashion, hitting their first three 3-pointers along with a pair of free throws to go up 11-0 in the first two minutes. The Sycamores were forced to use a timeout and recollect. The Sycamores then posted up their first points of the game off a jumper from guard Allante Holston and a three from guard Christian Williams, bringing the score within eight points, 13-5. This was the closest Indiana State got to Bradley before the Braves took full control. In the remaining seven minutes of the half, the Braves went on a 22-7 run to go up 54-27 heading into the locker room. The highlight came at the end when Brown scored back-to-back threes and a driving layup in front of a roaring Carver Arena crowd. He led the first half with 19 points. The Braves’ offense continued to bring the heat for the second half, with a 37-point lead apex around the 10-minute mark off junior Nate Kennell’s 3-pointer. This was Bradley’s largest lead of the night. The 96-67 win was the largest in 13 years for Bradley in MVC play. 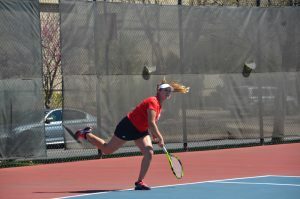 Wardle was pleased with his team’s ability to keep the lead, even though there were some instances the Braves faltered. Brown led all scorers with 26 points and notably made a career-best six 3-pointers on only nine attempts. Freshman forward Ja’Shon Henry had a season-best performance of his own, scoring 17 points and pulling down five rebounds. Henry said he was pleased with his performance and was ready to be called into the game. He pointed to lessons he had learned from this season as a reason for his success. Wardle noted that Henry’s career-best performance was not surprising. Bradley currently sits at seventh in the MVC standings with six games to go. To avoid a Thursday game in Arch Madness, they need to finish in the top six. After winning five out of the last seven games, they host MVC leader Loyola-Chicago on Wednesday night. Tipoff is at 7 p.m at Carver Arena.